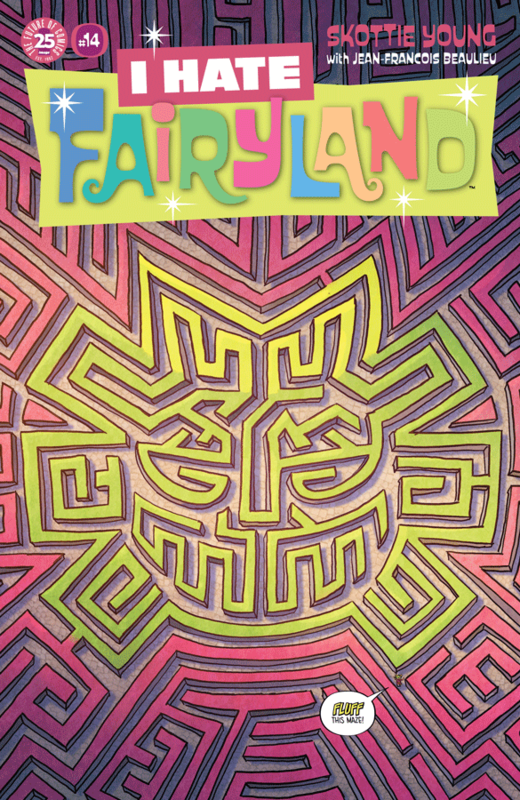 Gert continues her quest to be good in I Hate Fairyland #14, but her destiny leads her to a maze. A literal maze. It leads to innuendos, marriage jokes, and some homages to Labyrinth. Let the fun begin. As usual, there’s lots of humor. There’s some action as lots of people die. There’s bright colors, imaginative fantasy characters, and a nice little twist or two at the end. Without spoiling anything, I Hate Fairyland #14 is yet another beautifully illustrated and hilariously written comic. If you are a fan of the series, it’s issues like this that keep you reading. Now if anyone reads this any you haven’t started reading the series yet, do so. It’s issue #14 and it still awesome. Need you more reason than that? Plus this one is a pretty decent issue for new readers to jump into, or for fans of Labyrinth. You might miss out on a few of the inside jokes and on running gags, but for the most part, the laughs will hit and the story will make sense. With nothing to complain about and everything to enjoy, I give this issue a five out of five metal bikinis.